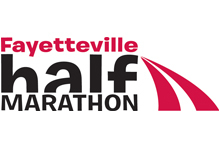 The 2012 Fayetteville Half Marathon will have athlete tracking available on this site. Entries - Lists of entries for the event. Results - Results will be posted at the events completion with official times and places. To find a result before they are official you can view the Athlete Tracking link. Leaderboard - This will display the top 10 male and female runners at each split and at the finish. Athlete Tracking - Individual athlete updates which will display split times at the 5k, 10k and 15k splits as well as the finish. Search for the athlete you wish to track and add them to your tracking queue.